The GHS Student Athletic Council wants to encourage all students to attend athletic events this winter to promote school spirit! This week, one varsity event for each sport hosting a home event will be free admission for any GHS student showing their current GHS ID. The swim/dive team hosts the RedHawk Relays TOMORROW at 10:00 a.m., and the girls basketball team hosts Plymouth TOMORROW starting at 6:15 p.m. for JV and 7:45 p.m. for varsity. Bring your ID and a friend and you will get in free. Also, the athletic department has five game punch cards for the price of four games for $20. These punch cards are good for admission to all sports except for boys basketball. You can purchase these in the athletic department during the school day. TOMORROW’S theme for the girls basketball game vs. Plymouth is Beach Night! You’ve heard about the 12 days of Christmas, right? Well, you’ve got 12 ways to win at the Interra Credit Union RedHawks Branch located in the commons! It’s so easy to enter, and you can do it every day the branch is open if you want. You could win gift cards for the movies, Hacienda, or Honey’s! The promotion continues through Wednesday, December 12th. Winners will be announced on December 14th. The RedHawks Branch is open during the lunch hour on Wednesdays and Fridays. Stop by to see us, and get all of the details! French Club will meet on Tuesday, December 4th during the 2nd session of SRT in room 2410. We will discuss our upcoming fundraisers and will have a white elephant gift exchange. If you want to participate in the gift exchange please bring a wrapped gift under $5 to the meeting. Also, feel free to bring a snack to share. Hope to see you there! The C team for girls basketball lost to Plymouth 34-28 after a hard fought game. Trinity Nemeth led the team with nine points, Brooklyn Collins had seven, and Abby Wileman added five. The Lady RedHawks swim and dive team defeated Plymouth, but lost to Northridge at the Goshen Aquatic Center. The RedHawks had great swims by Eve Miller in the 200 freestyle and Kassidy Bestul in the 500 freestyle. Zoe Eichorn placed 1st in the 50 free, followed by Lauren Murphy in 5th place. Boys basketball will travel to Mishawaka High School. JV plays at 6:00 p.m., followed by varsity at 7:30 p.m. Boys varsity wrestling will compete in the Plymouth Super Duals at 9:00 a.m. Boys JV wrestling will compete in the Concord Invitational at 9:00 a.m. The C team for girls basketball will host Northwood at 10:00 a.m. The boys and girls varsity swim & dive teams will host the Goshen B/G Relays at 10:00 a.m. Boys freshmen basketball will host Lakeland at 11:15 a.m. The C team for girls basketball will play at Bethany at 1:00 p.m. Girls basketball will host Plymouth. JV plays at 6:15 p.m., followed by varsity at 7:45 p.m. 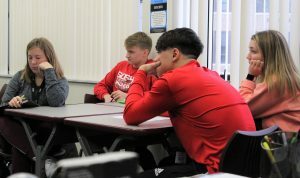 Yesterday we continued exploring what it means to grow up in Goshen Community Schools, as we observed a few classes of sophomores and juniors. 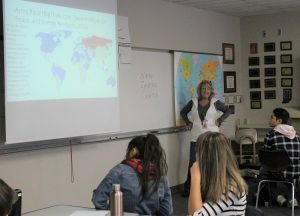 We started the morning in Barrett Younghans’ World History class where they were learning about the Arab/Israeli conflict. 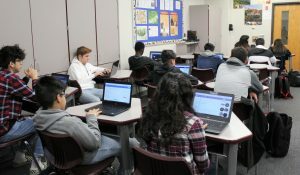 After doing a quick review of the materials that they had been discussing in the last three class periods, Mr. Younghans had the students get into small groups and open up an educational app called Quizlet on their computers. The app asked the students questions about the information they have been studying and the groups “raced” against the other groups to see who could answer all of the questions (correctly) first. 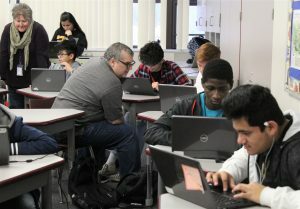 After the first two rounds of the game, Mr. Younghans told the class, “I don’t want to throw shots, but judging by these scores, you might need to study a little bit more.” He asked the students to get into new groups, and they played a couple more rounds, until Mr. Younghans determined that it was time to quit. Incidentally, the student pictured below was on every winning team, and they won each round by a lot! Well done, young man! 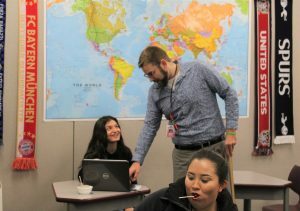 While the students were working on their assignment, Mr. Younghans talked about the the other supporting adults in the room; there was a paraprofessional who works 1:1 with a student, another Special Education teacher was in the classroom to support other students, and an EL (English Learners) collaborator was there to help students who are learning the English language and the World History subject content at the same time. Lastly, Mr. Younghans noted that he and Ms. Orama will look over test answers of EL students, whether the students attempt to answer in English or they need to write in Spanish. 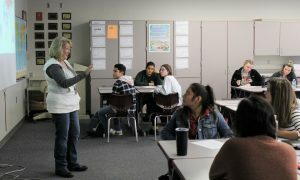 The teaching staff will give them credit if they determine that the students know the content, but are struggling to write it correctly in English. 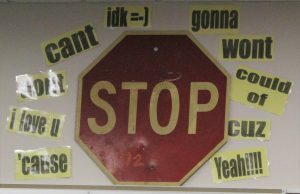 What a supportive way to teach students! 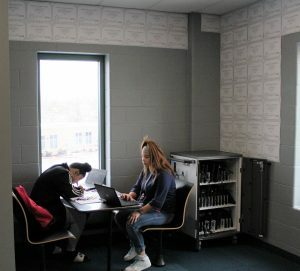 The staff is giving the students a chance to prove that they know the content, even if expressing their answers in a second language may still be difficult.for them. Learning a new language and subject matter at the same time is not easy, but with support, students can do both. Ms. Magnuson asked the students to choose a Letter to the Editor from several examples, and were then given this assignment: Summarize the article and then answer these questions; Does the author establish credibility? If so, how? If not, what could they have done differently? Is the argument successful? After the students were done with the short assignment, they discussed their answers with partners and then as a whole class. One answer for establishing credibility included using statistics to prove that the author had done his/her research and knew the topic. Another response from a student indicated that the author had not really established credibility, but then the student offered ideas on how the author could improve upon that. 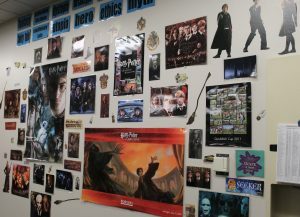 Ms. Magnuson had signs and posters around the room; some that encouraged students what not to use in formal writing, some that included the IB character traits, and also a wall of Harry Potter pictures and posters (probably to encourage students to read!). The students then spent time working on their “Historical Investigations” which will be their final exam. 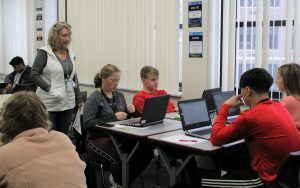 Mrs. Mehl reminded them that the Historical Investigations will be due on “December 21st, only 18 school days away.” They discussed when certain sections of the project were due and when they would be checked by Mrs. Mehl, and then the students got to work on their laptops. Mrs. Mehl circulated throughout the classroom to answer questions and offer suggestions. 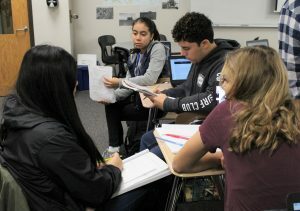 It is easy to see that these sophomores and juniors are continuing to grow, and that they are learning about increasingly in-depth topics. 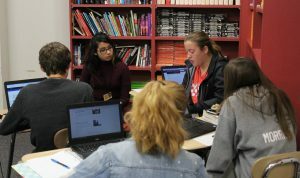 Two other things that were definitely evident in this visit to GHS: the emphasis placed on reading for comprehension, and the instruction for good, solid writing. And those things are not just coming from the English classes. Instead, they are stressed in all classes. Students who know how to read, summarize, and take notes, and know how to write well are well-prepared for classes at the next level, no matter what that may be for them. 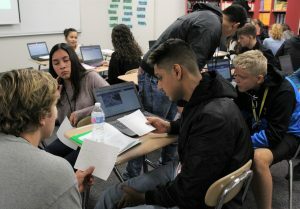 GHS principals and teachers often hear back from college students, and those students say that they are glad they were challenged in reading and writing at GHS, because they are better prepared than many of their peers. Thank you, GCS teaching staff, for always striving for excellence! As always, it was a pleasure to see GCS teachers and students in action. Truth be told, we would go back to school in GHS classrooms any day! Student Council Members: TODAY’S Student Council meeting is cancelled. We will instead have a virtual meeting on Google Classroom, so make sure to check and read all info. Make sure you reply with your input regarding the items covered. Stay In bounds Ambassadors who visit on Thursdays will visit TODAY. Meet Mr. Kissinger and Mrs. Magnuson at the welcome center with your lesson plan immediately following 2nd period. The GHS Student Athletic Council wants to encourage all students to attend athletic events this winter to promote school spirit! This week, one varsity event for each sport hosting a home event will be free admission for any GHS student showing their current GHS ID. The swim/dive team hosts the RedHawk Relays this Saturday at 10:00 a.m., and the girls basketball team hosts Plymouth this Saturday starting at 6:15 p.m. for JV and 7:45 p.m. for varsity. Bring your ID and a friend and you will get in free. Also, the athletic department has five game punch cards for the price of four games for $20. These punch cards are good for admission to all sports except for boys basketball. You can purchase these in the athletic department during the school day. Saturday’s theme for the girls basketball game vs. Plymouth is Beach Night! There will be an art club meeting TODAY during the 2nd session of SRT in room 1450. We will be doing Christmas fun stuff…..decorations, etc. Please bring $1 to cover expenses. Any girls interested in being on the track & field team this spring – there will be a call out meeting TODAY during the 2ndsession of SRT in Whiteman Gym. There will be a mandatory callout meeting TODAY during the 2nd session of SRT in the main gym for all boys interested in competing in track for the upcoming season. Creative Writing Club will have an end of NaNoWriMo celebration TODAY during the 2nd session of SRT in room 2430. Whether you have written 50 words or 50,000 words, come and celebrate with us! There will be a chance to win prizes and time to share your writing if you want. Feel free to bring a snack to share. We will see you there! French Club will meet next Tuesday, December 4th during the 2nd session of SRT in room 2410. We will discuss our upcoming fundraisers and will have a white elephant gift exchange. If you want to participate in the gift exchange please bring a wrapped gift under $5 to the meeting. Also, feel free to bring a snack to share. Hope to see you there! The boys and girls JV and varsity swim & dive teams will host Plymouth and Northridge at 5:30 p.m. Boys freshmen basketball will host Plymouth at 7:00 p.m. The C team for girls basketball will host Plymouth at 7:00 p.m.
You’ve heard about the 12 days of Christmas, right? Well, you’ve got 12 ways to win at the Interra Credit Union RedHawks Branch located in the commons! It’s so easy to enter, and you can do it every day the branch is open if you want. You could win gift cards for the movies, Hacienda, or Honey’s! The promotion starts TODAY, and continues through Wednesday, December 12th. Winners will be announced on December 14th. 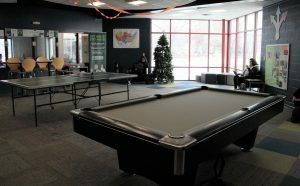 The RedHawks Branch is open during the lunch hour on Wednesdays and Fridays. Stop by to see us, and get all of the details! Auditions for the spring musical “ANNIE” will begin TODAY from 3:45-6:00 p.m. in the auditorium. All those wishing to audition should come prepared to sing 60 to 90 seconds of a song of your choice. It can be anything! We will have an accompanist, so bring your favorite Christmas carol, Broadway tune, choir song, or even a hymn and audition! This is going to be another outstanding GHS production! Student Council Members: TOMORROW’S Student Council meeting is cancelled. We will instead have a virtual meeting on Google Classroom, so make sure to check and read all info. Make sure you reply with your input regarding the items covered. Stay In bounds Ambassadors who visit on Thursdays will visit TOMORROW. Meet Mr. Kissinger and Mrs. Magnuson at the welcome center with your lesson plan immediately following 2nd period. There will be an art club meeting TOMORROW during the 2nd session of SRT in room 1450. We will be doing Christmas fun stuff…..decorations, etc. Please bring $1 to cover expenses. Any girls interested in being on the track & field team this spring – there will be a call out meeting TOMORROW during the 2ndsession of SRT in Whiteman Gym. There will be a mandatory callout meeting TOMORROW during the 2nd session of SRT in the main gym for all boys interested in competing in track for the upcoming season. Creative Writing Club will have an end of NaNoWriMo celebration TOMORROW during the 2nd session of SRT in room 2430. Whether you have written 50 words or 50,000 words, come and celebrate with us! There will be a chance to win prizes and time to share your writing if you want. Feel free to bring a snack to share. We will see you there! Boys JV basketball defeated Elkhart Central 48-30. Isaac Sawatzky and Tommy Cartegena Garcia both had ten points leading the scoring for Goshen. Boys varsity basketball defeated Elkhart Central 55-42. Freshman Drew Hogan scored 15 points, and Bryant Robinson had 13 points and ten rebounds to lead Goshen. The win brings Goshen even with a record of 1-1. TONIGHT’S theme night for the boys basketball game vs. Elkhart Central is RedOut! The GHS Student Athletic Council wants to encourage all students to attend athletic events this winter to promote school spirit! This week, one varsity event for each sport hosting a home event will be free admission for any GHS student showing their current GHS ID. The boys basketball team hosts Elkhart Central TONIGHT, the swim/dive team hosts the RedHawk Relays this Saturday at 10:00 a.m., and the girls basketball team hosts Plymouth this Saturday starting at 6:15 p.m. for JV and 7:45 p.m. for varsity. Bring your ID and a friend and you will get in free. Also, the athletic department has five game punch cards for the price of four games for $20. These punch cards are good for admission to all sports except for boys basketball. You can purchase these in the athletic department during the school day. Auditions for the spring musical “ANNIE” will begin TOMORROW from 3:45-6:00 p.m. in the auditorium. All those wishing to audition should come prepared to sing 60 to 90 seconds of a song of your choice. It can be anything! We will have an accompanist, so bring your favorite Christmas carol, Broadway tune, choir song, or even a hymn and audition! This is going to be another outstanding GHS production! Stay In bounds Ambassadors who visit on Thursdays will visit this Thursday. Meet Mr. Kissinger and Mrs. Magnuson at the welcome center with your lesson plan immediately following 2nd period. Any boys interested in playing baseball this spring, there will be a call out meeting TODAY during the 2nd session of SRT in Mr. DuBois’ classroom, room 1090. Attention Softball Players: The softball program will have a call out meeting for all potential players trying out in the spring TODAY during the 2nd session of SRT in the main gym. If you are currently in a winter sport and are thinking about going out in the spring for softball you should attend. Go Hawks! The boys golf team will have a call out meeting TODAY during the 2nd session of SRT in Whiteman Gym. This call out meeting is for boys who have played on the team in the past and for any boy interested in learning more about playing golf for GHS. During the meeting, the coaches will outline the upcoming schedule, you’ll have a chance to meet the coaching staff, and there will be handouts with information about the pre-season conditioning. There will be an art club meeting on Thursday, November 29th during the 2nd session of SRT in room 1450. We will be doing Christmas fun stuff…..decorations, etc. Please bring $1 to cover expenses. Any girls interested in being on the track & field team this spring – there will be a call out meeting during the 2ndsession of SRT on Thursday, November 29th in Whiteman Gym. There will be a mandatory callout meeting during the 2nd session of SRT in the main gym this Thursday, November 29th for all boys interested in competing in track for the upcoming season. Student Council will meet on Thursday, November 29th during the 2nd session of SRT in the auditorium. We will discuss several agenda items and would like as much student feedback as possible. Make sure to check Google Classroom for the agenda and please plan on attending. Email Mrs. Walters with any questions or concerns at awatlers@staff.goshenschools.org. Creative Writing Club will have an end of NaNoWriMo celebration on Thursday, November 29th during the 2nd session of SRT in room 2430. Whether you have written 50 words or 50,000 words, come and celebrate with us! There will be a chance to win prizes and time to share your writing if you want. Feel free to bring a snack to share. We will see you there! The boys and girls JV and varsity swim & dive teams will compete at Concord at 5:00 p.m. Boys basketball will host Elkhart Central. JV plays at 6:00 p.m., followed by varsity at 7:45 p.m. Welcome back! We hope you all had a wonderful Thanksgiving! TOMORROW’S theme night for the boys basketball game vs. Elkhart Central is RedOut! Attention FCA Members: This is a reminder that our meeting will be TOMORROW at 7:30 a.m., and NOT Wednesday due to a staff meeting. The GHS Student Athletic Council wants to encourage all students to attend athletic events this winter to promote school spirit! This week, one varsity event for each sport hosting a home event will be free admission for any GHS student showing their current GHS ID. The boys basketball team hosts Elkhart Central TOMORROW night, the swim/dive team hosts the RedHawk Relays this Saturday at 10:00 a.m., and the girls basketball team hosts Plymouth this Saturday starting at 6:15 p.m. for JV and 7:45 p.m. for varsity. Bring your ID and a friend and you will get in free. Also, the athletic department has five game punch cards for the price of 4 for $20. These punch cards are good for admission to all sports except for boys basketball. You can purchase these in the athletic department during the school day. Auditions for the spring musical “ANNIE” will begin Wednesday, November 28th from 3:45-6:00 p.m. in the auditorium. All those wishing to audition should come prepared to sing 60 to 90 seconds of a song of your choice. It can be anything! We will have an accompanist, so bring your favorite Christmas carol, Broadway tune, choir song, or even a hymn and audition! This is going to be another outstanding GHS production! Any boys interested in playing baseball this spring, there will be a call out meeting TOMORROW during the 2nd session of SRT in Mr. DuBois’ classroom, room 1090. Attention Softball Players: The softball program will have a call out meeting for all potential players trying out in the spring TOMORROW during the 2nd session of SRT in the main gym. If you are currently in a winter sport and are thinking about going out in the spring for softball you should attend. Go Hawks! Boys golf will have a call out meeting for all potential players TOMORROW during the 2nd session of SRT in Whiteman gym. There will be a mandatory callout meeting during the 2nd session of SRT in the gym this Thursday, November 29th for all boys interested in competing in track for the upcoming season. The Goshen boys swim and dive teams defeated Rochester, Northwood, DeKalb, and Angola at the Goshen Aquatics Center. The team was led by 1st place finishers Gabe Goertz, Nick Zehr, Alex Ramos, Mason Schrock, and Sam Metcalfe. Goshen had a strong showing by all the swimmers that participated in the meet, led by their seniors and strong showings from the freshmen class. The Goshen girls swim and dive teams defeated DeKalb, Northwood, and Rochester losing to Angola at the Goshen Aquatics Center. The team was led by 1st place finisher Zoe Eichorn, with strong performances by Ellie Walters, Makala Saeger, Ellie Zehr, and Sydney Penner. Girls varsity basketball picked up a 43-41 road win against the very tough Lady Eagles of Columbia City. The Lady RedHawks overcame a late surge by the Lady Eagles to pick up the two point victory. They were led by sophomore Brynn Shoup-Hill with 15 points, senior Maggie Gallagher with 12 points, and senior Josie Walters with ten points. With the win the RedHawks improved to 4-2 on the season. Girls JV basketball lost to Columbia City 13-38. Girls varsity basketball lost 51-41 to host Tippecanoe Valley in the opening game of the Tippy Valley Thanksgiving Classic. The RedHawks were led by junior Lizzie Kirkton with 12 points, sophomore Brynn Shoup-Hill with nine points, and Josie Walters added eight points. The Lady RedHawks fell to 4-3 on the season. Girls varsity basketball picked up a 50-47 win against Whitko in the consolation game of the Tippecanoe Valley Thanksgiving Classic Tourney. The team was led by sophomore Brynn Shoup-Hill with game highs in points and rebounds with 28 points and 20 rebounds, junior Lizzy Kirkton with eight points, junior Regan Mast with seven points, and junior Hailey Mast added three points. Sophomore Brynn Shoup-Hill was selected to the All Tourney team with her performance. With the win the Lady RedHawks improved to 5-3 on the season, 1-1 on the day. Boys JV basketball won their season opener against Fairfield 41-38. Jarah Byler led the team with ten points. Isaac Sawatzky hit the game winning three as time expired for the win. Boys varsity basketball lost to Fairfield 55-38. Goshen was led in scoring by Bryant Robinson with 17 points. The boys freshman basketball team defeated Fairfield 34-26 drawing their record even to 1-1. Goshen was led in scoring by Jordan Williams with 16 points. 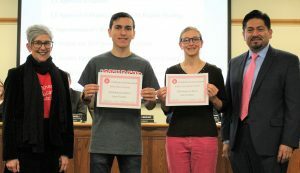 Goshen High School is one of 5 state finalists in the Indiana Samsung Solve for Tomorrow design competition, with their sediment pollution project. 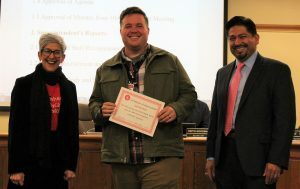 A huge thanks to Jason Kauffman and Goshen City for providing GHS with the design challenge and helping with resources. 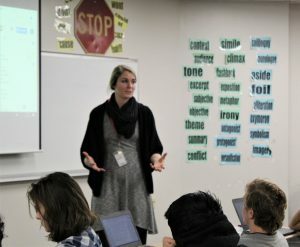 The next phase of the competition involves GHS Engineering and Design teacher Jen Yoder submitting the project plan, which she worked on over the weekend. This is a competitive challenge (they applied last year, but didn’t make the cut) so it is a huge honor to be selected to move on to the next phase. The 5 state finalists for Indiana are: Goshen H.S., Penn H.S., South Adams M.S., South Decatur Jr/Sr High, and Center for Inquiry-IPS2 – which is some pretty tough engineering competition. Phase One: Entry submission – How can STEM be applied to address a local community challenge/issue? 50% match from Samsung through donorschoose, up to $200. Mrs. Yoder will be submitting donorschoose materials soon. If we raise $400, Samsung will add an additional $200, making the total package worth $600. Watch for updates coming soon! Phase Two: Teacher Activity Plan for the project due December 10. Prize package: Samsung Video Kit ($1500 value) for next phase. Phase Three: 3 minute video demonstrating how STEM can be applied to help improve their local community through this project. Due February 15. Sediment is the number one pollutant in our local waterways, which comes from farm fields, construction sites, and urban yards. One source of sediment is from construction projects that lack a proper construction entrance/exit. Currently, the construction industry tends to use a construction drive constructed of #2 stone underlain with geotextile fabric. Unfortunately, these construction drives are not always installed correctly and can fail quickly. Sediment quickly accumulates in storm water runoff and eventually makes its way to our waterways. There are some existing ways to cause the sediment to “fall” out of storm water runoff by mixing in polyacrylamides (PAMS), but there is currently no effective and/or efficient way to add PAMS to sediment laden runoff without taking up a great deal of space. Sediment pollution creates a problem for our community from the runoff origination all the way to when it enters our waterways. How can STEM be applied to address this issue? We understand that you might not have the full solution right now or that your students may come up with a new solution later. We are looking for your overall project vision at this point. It will take the full spectrum of STEM to solve a problem such as sediment pollution. Students will evaluate current methods, applying the fault finding process, to determine and prioritize the parameters of the problem. 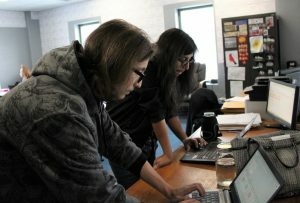 This will include scientific and mathematical applications as they relate to current practices and proposed solutions. The chemical compounds involved in PAMS deployment and contamination removal will introduce advanced science principals, while ratios for proper deployment will utilize math skills. The engineering design loop will be utilized continuously as students research, brainstorm, and develop solutions, or improvements to current practices. Development and use of necessary technology to carry out solutions will be key as well. Additionally, students will work collaboratively with each other, staff, community members and our city engineers. Working in a group setting to solve a problem is a lifelong skill that everyone benefits from. What is the biggest hurdle your students face in the classroom that hinders their academic achievement? 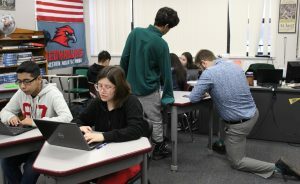 In a recent survey conducted with engineering students at our school, they stated the number one hurdle that hinders their achievement in the classroom is the amount of standardized testing they are mandated to participate in throughout the year. Testing frequently disrupts the schedule during the day taking time away from classes. 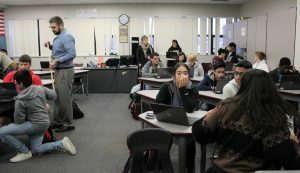 They stated that classes in tested areas are very focused on test-taking skills and specific content, which takes away from opportunities of project-based learning. 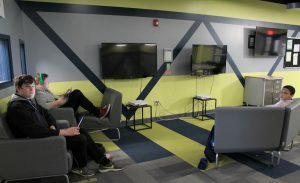 Elective classes, such as engineering and technology, are able to offer creative project-based learning experiences, but they are hindered by the lack of funding for updated equipment. Equipment is needed for prototyping and producing designs that truly display all of the details of the students’ chosen solution for effective test results and data for improvements. Although there is not much that can be done regarding state tests, this challenge may offer opportunities to address equipment needs. TODAY is the first visit for Stay In bounds Ambassadors. You should meet Mr. Kissinger and Mrs. Magnuson at the welcome center immediately following 2nd period if you make a Tuesday visit. If you have not yet submitted your travel permission forms, get those to the athletic office right away. ***WE WILL NOT HAVE AFTER HOURS TODAY DUE TO THANKSGIVING BREAK*** Homework help is available every Tuesday and Thursday in the media center from 3:45-5:00 p.m. You must be in the media center by 3:50 p.m. in order to stay for this, and dismissal times are at 4:30 p.m. and 5:00 p.m. You are expected to exit the building through door FF, which is located by the stairs just down from the media center. A bus will be available around 5:10 p.m. if you need a ride home. This bus is for students who stay for after-hours help ONLY. It will pick you up at the south end of circle drive by the flag pole. This is a great opportunity if you just need a little extra time or even just a quiet place to do your homework at the end of the day. We have a break from school beginning TOMORROW – do you have a book to read on your days off? If not, stop by the library to check one out! The theme for Saturday’s boys basketball game vs. Fairfield is Farmer Night. JV plays at 6:00 p.m., followed by varsity at 7:30 p.m. Please join us at Fairfield to show your support! The Big Sun Athletic Scholarship is now available. The requirement is that you have played one season of a sport your senior year. You must apply online at http://www.bigsunathletics.com. The 2018 yearbook has arrived! The books are being delivered to the SRT of the student who purchased the book. If the student is not in SRT, the book will be returned to room 1400. There are a few extra books that can be purchased for $45 in room 1400. Students may pick up books for siblings or graduates in room 1400. If you are a parent who will come in to pick up a yearbook for your graduate, please e-mail Susan Long at slong@goshenschools.org to make arrangements for her to leave it with Mr. Huser at the Welcome Center. Attention German Students: Our next meeting will be TODAY during the 2nd session of SRT in the Media Center. We will be decorating the Christmas tree before Thanksgiving break. Wear your German Club shirt on Tuesday! Any boys interested in playing baseball this spring, there will be a call out meeting during the 2nd session of SRT on Tuesday, November 27th in Mr. DuBois’ classroom, room 1090. Attention Softball Players: The softball program will have a call out meeting for all potential players trying out in the spring on Tuesday, November 27th during the 2nd session of SRT in the main gym. If you are currently in a winter sport and are thinking about going out in the spring for softball you should attend. Go Hawks! Boys golf will have a call out meeting for all potential players on Tuesday, November 27th during the 2nd session of SRT in Whiteman gym. The girls basketball C-team beat Elkhart Memorial 27-14. Chloe Collins had four points, three steals, and four offensive rebounds, while Trinity Nemeth added six points, and Brooklyn Collins scored twelve points with five rebounds. Boys freshman basketball lost to Elkhart Memorial 28-21. They were led by Jordan Williams who scored ten points. Isaiah Park added four points, and Carter Schmucker added three for the RedHawks, who fell to 0-1 on the season. The boys and girls varsity swim & dive teams will host the Goshen DecaDuals at 5:00 p.m. Girls basketball will travel to Columbia City. JV plays at 6:00 p.m., followed by varsity at 7:30 p.m. Boys varsity wrestling will compete in the Lafayette Harrison Super Dual at 11:00 a.m. Boys varsity wrestling will compete in the Lafayette Harrison Super Dual at 8:30 a.m. Girls varsity basketball will compete in the Tippecanoe Valley Tournament at 10:30 a.m. Boys freshmen basketball will play at Fairfield at 6:00 p.m. Boys basketball will travel to Fairfield. JV plays at 6:00 p.m., followed by varsity at 7:30 p.m.
***WE WILL NOT HAVE AFTER HOURS TOMORROW DUE TO THANKSGIVING BREAK*** Homework help is available every Tuesday and Thursday in the media center from 3:45-5:00 p.m. You must be in the media center by 3:50 p.m. in order to stay for this, and dismissal times are at 4:30 p.m. and 5:00 p.m. You are expected to exit the building through door FF, which is located by the stairs just down from the media center. A bus will be available around 5:10 p.m. if you need a ride home. This bus is for students who stay for after-hours help ONLY. It will pick you up at the south end of circle drive by the flag pole. This is a great opportunity if you just need a little extra time or even just a quiet place to do your homework at the end of the day. We have a break from school beginning Wednesday – do you have a book to read on your days off? If not, stop by the library to check one out! Attention German Students: Our next meeting will be TOMORROW during the 2nd session of SRT in the Media Center. We will be decorating the Christmas tree before Thanksgiving break. Wear your German Club shirt on Tuesday! Boys freshmen basketball will host Elkhart Memorial at 7:00 p.m. The C team for girls basketball will host Elkhart Memorial at 7:00 p.m. Enjoy this Superintendent Step In as we take a look at the GHS Women’s Choir, under the direction of Monica Stutzman. This was a favorite for Dr. Woodworth, who participated in choirs throughout her education and still likes to sing! GHS presents Agatha Christie’s Appointment With Death TONIGHT and TOMORROW NIGHT at 7:30 p.m., and Sunday at 2:00 p.m. Tickets are $8 for adults, $5 for students and seniors 65 and older, and $20 for families. They can be purchased at the door. If you are a sophomore or junior, and are interested in participating in our next Europe Art Trip, there will be a general meeting for you and your parents TODAY at 4:00 p.m. in room 1010 across from the cafeteria. Please see Mr. Zuber in 8080 for details. We have a break from school next week beginning on Wednesday – do you have a book to read on your days off? If not, stop by the library to check one out! HELP WANTED: The Burger King locations on Elkhart Rd. and Lincolnway East, as well as the Chili’s restaurant on Elkhart Rd., are currently hiring for evening and weekend positions. Interested students can apply in person directly at the restaurants, or at BKCareers.com. For additional information, contact Brendon McCullin at bmccullin@qdi.com. Ceres Solutions Scholarships is available in the Guidance Office or at www.ceres.coop. You must have been involved in four years of 4-H or two years of your local FFA program. Attention German Students: Our next meeting will be Tuesday, November 20th during the 2nd session of SRT in the Media Center. We will be decorating the Christmas tree before Thanksgiving break. Wear your German Club shirt on Tuesday! Girls JV basketball defeated a tough Westview team 35-22. The RedHawks were led in scoring by junior Hannah LaFary with twelve points, and sophomore Noemi Vela with seven points. The defense was led by a lockdown performance from juniors Bessie Buzzard and Remya Johnson. Girls varsity basketball picked up their first home win 57-19 against the visiting Lady Warriors of Westview. The Lady RedHawks were led in scoring by senior Josie Walters with 14 points, sophomore Brynn Shoup-Hill with 13 points, and junior Lizzy Kirkton who added eight points. Boys JV wrestling will compete in the West Noble Invitational starting at 9:00 a.m.
GHS presents Agatha Christie’s Appointment With Death on November 16th and 17th at 7:30 p.m., and November 18th at 2:00 p.m. Tickets are $8 for adults, $5 for students and seniors 65 and older, and $20 for families. They can be purchased at the door. It’s White Out Night for girls basketball TONIGHT! Come out and support your Lady RedHawks as they take on the Westview Warriors. JV tips off at 6:00 p.m., followed by varsity at 7:30 p.m.
Stay In Bounds Ambassadors are reminded that their first visits are TODAY and/or next Tuesday. Please make sure you submit your field trip forms to Mr. Kissinger. If you need a copy, you can pick one up from Mrs. Schrock in the athletic office. Please check your emails! You received an email with your final school assignment, teacher, and school. Report to the welcome center immediately after 2nd period on your visit days to check out with Mrs. Magnuson or Mr. Kissinger. Thank you! If you are a sophomore or junior, and are interested in participating in our next Europe Art Trip, there will be a general meeting for you and your parents TOMORROW at 4:00 p.m. in room 1010 across from the cafeteria. Please see Mr. Zuber in 8080 for details. Creative Writing Club is meeting TODAY in room 2430 during the 2nd session of SRT. We will look at developing our characters for NaNoWriMo. We hope to see you there! Girls basketball will host Westview. JV will play at 6:00 p.m., followed by varsity at 7:30 p.m. Good luck ladies! On April 23rd, 24th, 25th, and 26th some students at Goshen High School will be taking required state ISTEP, ECA, and ILEARN tests. Because only selected students must take the exam, the rest of the students will participate in online learning partial days. This means that all students who are testing should arrive at their normal time. All other students do not have to arrive at GHS until 10:45 a.m. 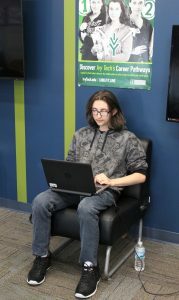 However, all students not testing will have assignments that need to be completed on their computer. These late start online learning days only apply to students who are not testing. If you are not certain if your child needs to participate in either test, please have them check with their SRT teacher, Guidance or the main office. If your child rides a bus, the busses will run at the normal times. Students who are not testing will be allowed to work on the online assignment or other homework in the cafeteria. There will be no delayed buses those mornings. Again, if students choose not to arrive until 10:45 a.m., they will be responsible for their own transportation. These alternate schedules are put in place to help provide an excellent testing environment. Please feel free to contact the principal or any of the assistant principals if you have questions. Their email addresses are found below. Thank you for your cooperation regarding the change in schedule on these days. Yesterday we visited Goshen Online Academy (GOA), one of the alternative education options available to GHS and GMS students. 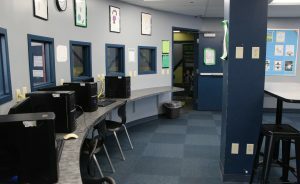 The academy is located in the Boys and Girls Club, in their Academic Wing. 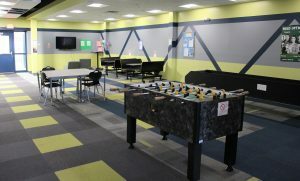 The wing is used after school by Boys and Girls Club members, most of whom are also Goshen Community Schools’ students. 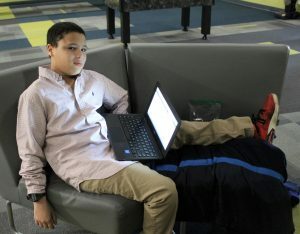 In the Academic Wing, there are plenty of places for GOA students to sit and study, read, or work on their (1:1) laptops. 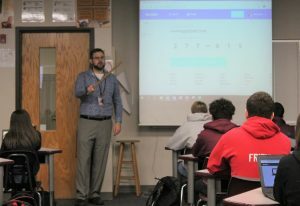 According to Josh Duell, the GOA teacher, GHS and GMS students have earned about 142 class credits so far this year, up considerably from last year. 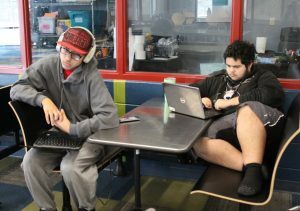 The students can attend GOA during one of two sessions, 9:00 a.m.-12:00 p.m. or 1:00-4:00 p.m. 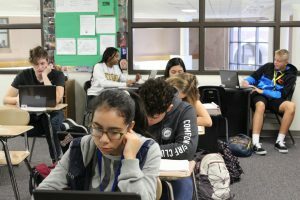 Many of the students are dual enrollment students, meaning they attend GHS or GMS half of the day and GOA the other half of the day. Mr. Duell stated that while the enrollment in GOA is somewhat fluid, they are currently serving between 60-70 students. He estimated that by the end of the semester the average credits earned per student would be about 4. However, there is one student who has already earned 12 credits during this school year. 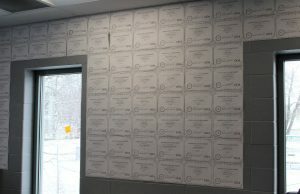 Below, you can see the paper certificates, one per credit, lining the wall of the office area, showing just how many credits have been earned by students this year. Mr. Duell explained that students come to GOA for many different reasons. 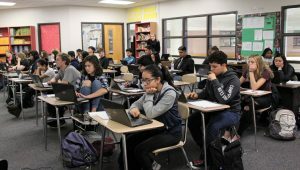 For some students, being in a typical secondary classroom just simply does not work for them, or some students may have health issues that keep them from attending GMS or GHS. Student may also have anxiety and find that a classroom full of students can feel overwhelming to them. Or, some students may have behavioral issues that make it difficult for them to function in a typical classroom setting. Whatever the myriad of reasons may be, when students come to GOA they are welcomed and encouraged to earn the credits necessary to get their high school diploma. 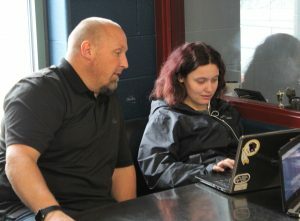 Below, Rafael Chavez an Instructional Collaborator at GOA, works with a student to help figure out a technology/program issue so that the student can keep moving ahead with the curriculum. Mr. Duell and Mr. Chavez reported that working with the students and their families is imperative to student success at GOA. According to Mr. Duell, “we may talk to parents up to several times a week. We call for attendance and tardy issues, but we call for many other reasons as well. 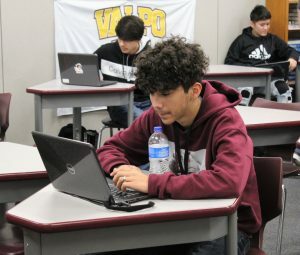 It is essential to student success that we keep in regular contact with the parents or guardians.” In addition, Mr. Chavez is also available to make contact with families if they prefer to communicate in Spanish. 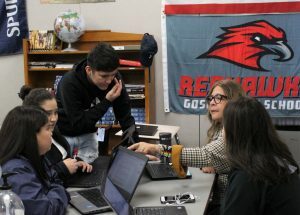 For most of the students who attend Goshen schools, a regular class schedule in a traditional classroom and school building works just fine. However, at GCS the staff is working hard to provide opportunities for every single student who enrolls in the district. And just as students learn differently and according to their own habits and needs, it makes sense that some students may need different settings to learn and grow. GCS is thankful for all of the staff members who assist every student in achieving their best potential, whether it is in a traditional setting or in one of the alternative schools. All students deserve a supportive environment with staff members who will guide them to their most fulfilled, productive futures! The link for TODAY’S GTV episode is https://youtu.be/l7s1xlxVolg. Stay In Bounds Ambassadors are reminded that their first visits are TOMORROW and/or next Tuesday. Please make sure you submit your field trip forms to Mr. Kissinger. If you need a copy, you can pick one up from Mrs. Schrock in the athletic office. Please check your emails! You received an email with your final school assignment, teacher, and school. Report to the welcome center immediately after 2nd period on your visit days to check out with Mrs. Magnuson or Mr. Kissinger. Thank you! If you are a sophomore or junior, and are interested in participating in our next Europe Art Trip, there will be a general meeting for you and your parents on Friday, November 16th at 4:00 p.m. in room 1010 across from the cafeteria. Please see Mr. Zuber in 8080 for details. Creative Writing Club is meeting TOMORROW in room 2430 during the 2nd session of SRT. We will look at developing our characters for NaNoWriMo. We hope to see you there! JV girls basketball lost a tough, hard fought game to the Marian Lady Knights 48-50. The RedHawks were led in scoring by juniors Bessie Buzzard with twelve points, Hannah LaFary with nine, Remya Johnson with eight, and freshman Tori Eldridge with eleven. Girls varsity basketball lost 44-40 in their home opener to the visiting Lady Knights of Marian. The RedHawks were led in scoring by senior Josie Walters with twelve points, junior Lizzy Kirkton with nine points – off the bench, sophomore Brynn Shoup-Hill with eight points, and junior Regan Mast added seven points in the loss. 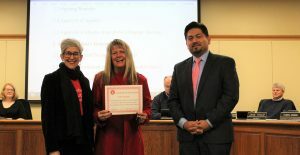 Elna Hussey, Administrative Assistant for School Nutrition Services—For all of her hard work and organization with the summer foods program, and receiving a great state inspection report of the program. Felix Perez-Diener, GHS senior—IHSAA State Qualifier in Cross Country, and also the Northern Lakes Conference champion and Sectional champion for the second year in a row! 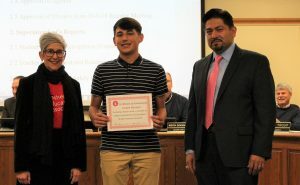 Joseph Narayan—For being chosen as a member of Indiana Department of Education’s Student Advisory Council. 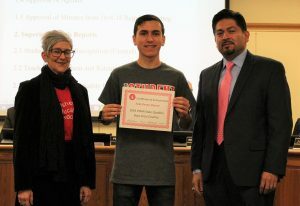 Joseph was nominated by GHS staff and then wrote an application essay before being chosen. 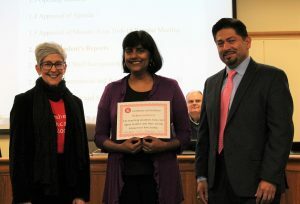 He has attended one meeting so far, and said that he enjoyed working with his peers and discussing possible legislation which will impact school districts across the state. Joel Kratzer, ED teacher at GMS—For the caring and committed work he does with his students and their parents. Robina Sommers, High Ability teacher at Chandler—For teaching students how civil rights leaders and their words can impact our lives today. The first ESports Club meeting will be after school TODAY in room 1070. If you haven’t already done so, please contact Mr. Perry at mperry@goshenschools.org if you are still interested in joining. For all girls & boys tennis players, there will be a meeting TODAY in the main gym during the 2nd session of SRT. We will discuss the winter skill development schedule as well as other playing opportunities, and give an update on the court renovation project. If you are not able to make it, please contact Coach Love for the information. The girls basketball C team defeated Westview 31-19. Trinity Nemeth led the way with four steals, 75% from the free throw line, and 14 points. Girls basketball will host Mishawaka Marian. 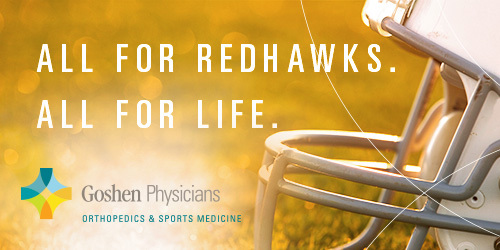 JV will play at 6:00 p.m., followed by varsity at 7:30 p.m. Go RedHawks! A parent/player meeting for all winter sport student athletes (except girls basketball team members) will be held in the main gym TONIGHT at 6:30 p.m. All student athletes are expected to attend with at least one parent. The first ESports Club meeting will be after school TOMORROW in room 1070. If you haven’t already done so, please contact Mr. Perry at mperry@goshenschools.org if you are still interested in joining. Congratulations to the Crimson Marching Band for competing in the Bands of America Grand Nationals this past weekend! The group advanced on to semi-finals and was named as one of the top 30 marching bands in the country. In our class, the Crimson Marching Band placed 7th. Congratulations to all members on a fantastic season and representing the city of Goshen and our school so well! Students and Teachers – Please return all completed flu shot forms to Nurse Wendy. For all girls & boys tennis players, there will be a meeting TOMORROW in the main gym during the 2nd session of SRT. We will discuss the winter skill development schedule as well as other playing opportunities, and give an update on the court renovation project. If you are not able to make it, please contact Coach Love for the information. Girls varsity basketball lost on the road 30-26 to Fairfield. The RedHawks were led in scoring by Josie Walters with nine points. Thank you to all our fans who came out to support us! The girls basketball C team will play at Westview at 6:00 p.m. Good luck ladies! Attention German Students: The German Club t-shirts are in! See Mrs. Bruder after school TODAY in room 1460. 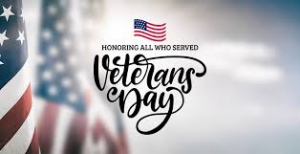 The Interra RedHawk Branch will be closed TODAY. You can always visit any of our other many locations for your financial needs. Thank you to those who have signed up for the blood drive TODAY! Everyone who signed up should check their email for important information. There are still a few spots open. See Mrs. Clark in room 2280 if you’re still interested. Any winter sport athlete participating in their first sport season at GHS is required to attend the Be the Best workshop in the cafeteria after school TODAY. You are excused from practice. Do NOT change for practice first. Come to the cafeteria right away after school, get your snack, and proceed to the far west side of the cafeteria so we can commence the program as close to 3:45 p.m. as possible. You will return to practices by 5:00 p.m., and swim/dive team members will be given a ride to GMS. A parent/player meeting for all winter sport student athletes (except girls basketball team members) will be held in the main gym on Monday, November 12th at 6:30 p.m. All student athletes are expected to attend with at least one parent. The first ESports Club meeting will be on Tuesday, November 13th after school in room 1070. If you haven’t already done so, please contact Mr. Perry at mperry@goshenschools.org if you are still interested in joining. For all girls & boys tennis players, there will be a meeting on Tuesday, November 13th in the main gym during the 2nd session of SRT. We will discuss the winter skill development schedule as well as other playing opportunities, and give an update on the court renovation project. If you are not able to make it, please contact Coach Love for the information. Girls basketball will play at Fairfield. JV plays at 6:30 p.m., followed by varsity at 8:00 p.m. Good luck ladies!